No one can celebrate a birthday quite like me! I’m turning 2 and you’re invited to help me celebrate at Roy’s Birthday Bounce. Bounce into Sky Zone MacGregor on Thursday 22 June from 6-8pm. A night full of fun and games on the trampolines as well as great prizes to be won. Tell Mum and Dad not to worry about dinner as I’ve prepared a feast! Entry is completely free, as well as your grip socks for unlimited bouncing! Make sure you RSVP below and you could win your very own birthday bash thanks to my good friends at Sky Zone MacGregor. Not a Roy’s Rookies or Brisbane Lions Junior Member? Click here to sign up for FREE now! Stay ROAR-Some and see you at Sky Zone! 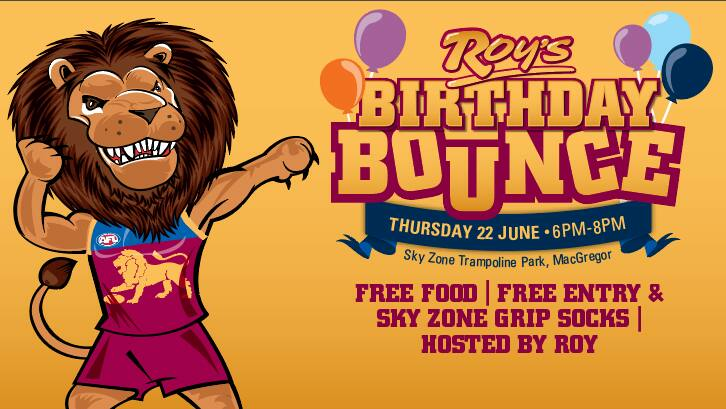 *To be eligible to attend, kids must be aged between 5-16 and registered to Roy’s Rookies or Brisbane Lions Members. Venue capacity is 300 - first in best dressed. A confirmation email will be sent to those registered and other placed on a waiting list. UPDATE: As of June 16 we’ve had over 500 registrations! Unfortunately, SkyZone can only hold 300, a confirmation email will be sent to the first 300 who RSVP and the others will receive a place on the waiting list.